...nor this much of it! Hubby picked up the early honey from the extractor's and the bottling has begun. It is packaged in clear, 1 litre containers which hold approximately 3 lbs. of honey. Because it is so heavy, it isn't cost-effective to mail but if you are in the local area and interested, the cost will be the same as always: $8.50/1 litre tub. This is natural, unpasteurized honey - just as it comes from the bees. There are still more honey supers out on the hives and we will spend the next few days taking those off and delivering them to be extracted. 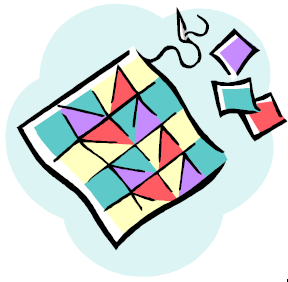 Quilting time will be at a premium this week! For some time I have been wondering about trying to reproduce the effect of those tin ceilings using tinfoil. There are several obvious obstacles in the process but the best way to see if something works is to actually try it. The first step is to transfer the design to the foil. I printed out an outline of New York Beauty blocks (my favourites) from EQ7. The widest tinfoil available was 18", intended for BBQ use, so that determined the width of my quilt . I didn't think I would be able to seam the foil together. 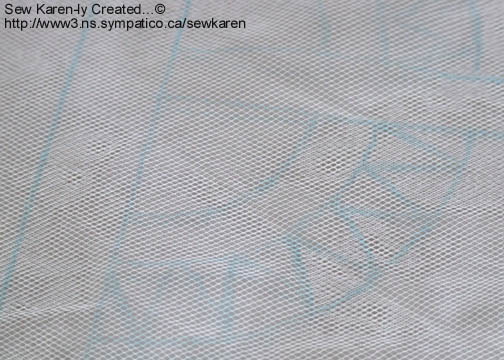 Over top of my pattern I laid off-white tulle and traced the design onto the tulle using a blue water-soluble marker. 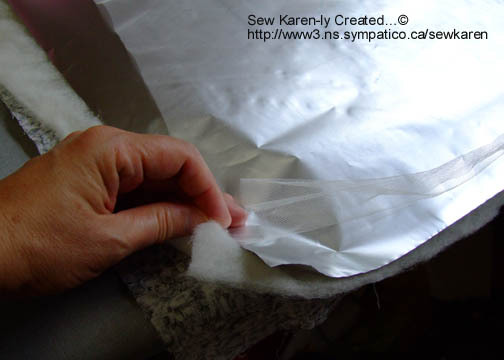 The four materials- tulle, foil, wool batt and cotton backing - were layered in the usual way. This brought me to the next stumbling block, as I normally pin baste. Spray basting would certainly be a better method for these materials so I may have to sneeze my way through a session to make this work. (lesson # 2). I ended up pinning along the perimeter using long straight pins. There were no concerns about how the machine would handle this unusual sandwich. Jeanne told me when I got the Bernina that it would sew anything and she is right. As always. It did take some experimenting to find the right thread, both shade and weight. Fine threads made the holes look too obvious, even with a small needle - more like punched tin. Finally I settled on a thick grey cotton thread, top and bottom. Originally I had intended to place the foil shiny side up but the thread blended better on the dull side so I went with that. (Jackie at Dayle's very kindly fetched a piece of tin foil for me to match the thread colour.) The machine had no issues at all...but I soon discovered some problems working with the foil. The first is that a piece this wide will wrinkle and crinkle as it makes contact with the side of the machine. (lesson # 4: keep it small). Another thing I hadn't considered is that it is impossible to "travel" from one spot to the next over previous stitching lines. As you can see on the right, after more than one pass of the needle the foil will tear. (lesson # 5: plan the quilting carefully before hand. Multiple starts and stops are preferable to travelling). In the end, I ditched this piece and sandwiched a new, smaller one. I quilted using a simple overall design which required no marking. The smaller piece did not touch the side of the machine, so no crinkles. I left the tulle in place to keep the foil secure. 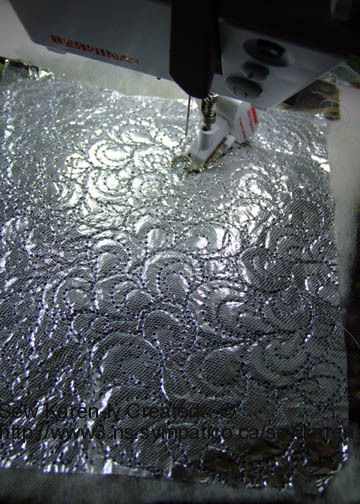 It wasn't easy to get a picture of the quilted tinfoil, but overall I am rather pleased with the look and happy with what I learned doing this. I will definitely try it again. 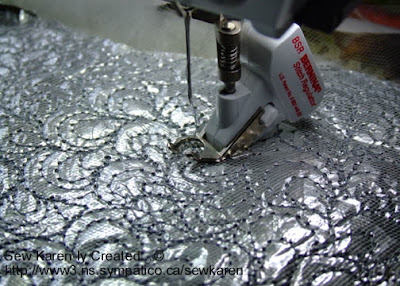 Awhile back on this blog, I showed you a Yuletide Jewel stitched by Bev Crouse of The Quilter's Net. Take a peek to see how it looks with a First Place ribbon on it! If you'd like to make your own Yuletide Jewel, pattern # 109 is available from the checkout on my website, or ask at your local quilt shop. It's a fun and quick Christmas project. I didn't coin the phrase in the title, but I sure like it. The bounty of Cumberland County, Nova Scotia, is of course blueberries. I was excited to get an invitation to go pick berries in the field where the bees had pollinated earlier this season. The mechanical harvester had already scooped the field but it always leaves lots for handpicking. Growing up in Five Islands, I spent summers on Lynn Mountain scooping blueberries; it was the only work available for area kids. I remember those days fondly, although I also remember it was hard, hot work. A cool breeze and pleasant company today made this a very enjoyable experience, but nothing to compare with the taste of these berries! Thank you Winston and Joan for your generosity. Thanks for all the great emails with questions concerning the Wonderfil thread I am using. Here's a close-up of the variegated "Mirage" I mentioned - it's the thread used to stitch the row of flowers in the centre section above. You can see it goes from a grey through middle shades of blue to navy. In the bobbin I am using a finer thread called "Deco Bob". A size 14 Cordonnet (topstitch) needle has worked well for all the decorative stitching I have done so far. 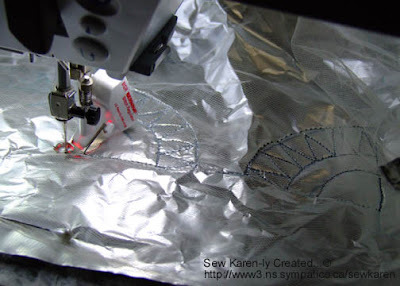 What fun this is to try out different machine stitches and various threads. It was a pleasant day of practising machine blanket stitching the edges of the applique pieces. I love the homey, old-fashioned look this stitch gives to the finished edge and it works up so quickly and evenly. When I got this sewing machine, The Bernina Lady told me I would LOVE the second way the 440 can work the blanket stitch, and she's right. See the difference between the stitching on the blue flower and this one below? Wow! Unbelievably, I am using the same thread but it does a double pass, giving more definition. These are Benartex balis, and the black thread is really making the colours pop. It has been such fun trying out the new threads from Wonderfil; their "Mirage" is going to be a big favourite around here. I am also indebted to the Bernina Lady for sharing additional tips on blanket stitching, which I will share in the workshops - with all due credit of course! I have started stitching sample blocks of different machine appliqué methods for a workshop to be held during the N.S. Fibre Arts Festival in October. Today I worked on "faced" appliqué. There are still a few spots left in the Friday class if you are interested in joining us; registration information may be found here. I ordered some new threads to play with, including lots of shades of Invisifil by Wonderfil. The big box contains an assortment of their most popular threads with jazzy names such as Tutti, Frutti, Razzle, Dazzle and a really sparkly hologram thread in silver/blue. (Can't wait to try that on some metallic Christmas prints for icy sparkle!) The Invisifil is a very, very fine thread which disappears into your quilting much like an invisible nylon does. but a neutral for the rest. The Invisifil was also used in the bobbin. The centre part of the star diamonds was stitched with simple curved lines to connect the corners. I marked a spine on the yellow border and then quilted some very loosey-goosey feather loops along that spine. I am still undecided as to how to quilt the outer red border but hopefully inspiration will hit soon. New York Roundabout now in New Hampshire! 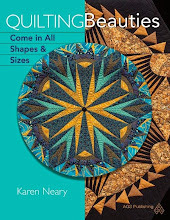 ...but it refers to my New York Roundabout quilt being featured in the new catalog from Keepsake Quilting...which is, of course, in New Hampshire. Regular readers will remember this piece from a little while back, which I designed for Benartex using their Fossil Fern fabrics. It is being offered as a complete kit - patterns, fabrics and pre-printed foundations - through Keepsake Quilting. They have it shown and listed as a table centrepiece; I think it looks great hung on a wall (but what do I know?) I do know it is very simple to sew, as the foundations do not need to be removed afterwards - they remain in the quilt. 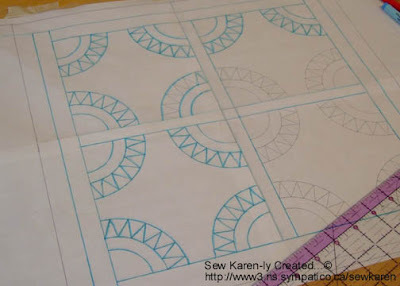 No special foot is required to sew the curves - I used my regular 1/4" piecing foot throughout the project. 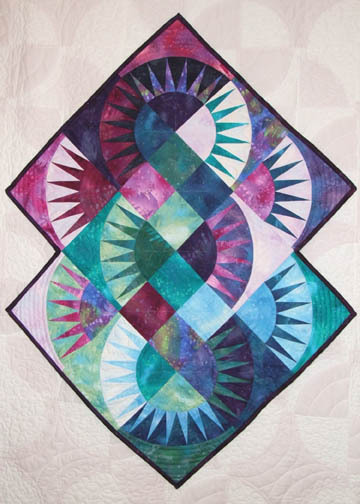 The gradations of colour within the fabric give the quilt lots of movement. Thanks to everyone who emailed to say they've seen the catalog, I had no idea it was to be in. 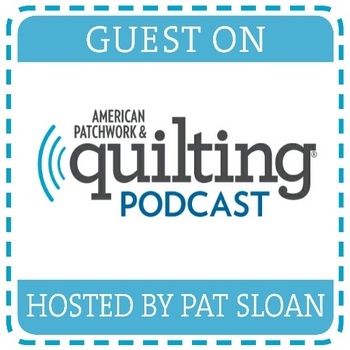 Canadian readers may order the kit through their local quilt shop, as it is being distributed on this side of the border by Trend Tex Fabrics. Edit: Individual patterns (not a kit) for NY Roundabout Again (#112) now available on the checkout page of my website. Today I am working on beeswax molds. Beeswax has a variety of uses, but for quilters the main two are in batiking fabrics and in preventing thread from knotting up when hand sewing. Just run the bar of wax along your thread and voila - no more tangles. These are the hexagonal molds I am using - 1 oz. and 1.5 oz. Hubby supplied me with that big hunk of beeswax you see on the right. The wax may be melted in the microwave, or in a metal container in a pan of water. Each mold is left to sit for a couple of hours to cool before the wax is popped out. Then they are individually packaged for sale. Yesterday I had the pleasure of attending the opening day of the Northumberland Quilt Guild Show in Pictou, Nova Scotia. Travelling with Marilyn and Lynn made for a very enjoyable drive along the Sunrise Trail which runs along the north shore of Nova Scotia. The annual show is held at the deCoste Centre, located near the waterfront. The day was beautiful and warm and many boats were out in the harbour. The show was beautifully arranged. I particularly liked the separate section of Christmas quilts, which even included a decorated Christmas tree. The vendors were located on the stage at the top of this photo. In the centre of the room there were interesting demonstrations set up, one with a longarm machine and another with guild members busily hand quilting -the best of both worlds. The following pictures are posted with permission from the organizers (it's always important to ask what the rules are). It's difficult to get good shots of the quilts while the show is on, as there were so many folks admiring the workmanship, but will include a few which stood out. I loved the colours of this centre quilt - the picture doesn't do it justice. This was my favourite and the one I voted for in the Viewer's Choice. It is a Feathered Star made by Betty MacKay. The appliquéd border set the patchwork off so nicely, and the hand quilting, done with the help of Elizabeth Byers, was spectacular. There were also a good number of entries which were machine quilted. While I was admiring the beautiful quilting on this tessellated quilt, the woman beside me spoke up to say she had quilted it. This is Gerene Chisholm a long-arm quilter from Debert, N.S. whose name is well-known in this area for her beautiful work. I was delighted to meet Gerene, and she graciously agreed to pose beside the quilt. There were several others quilted by Gerene also in this show, all beautifully done. 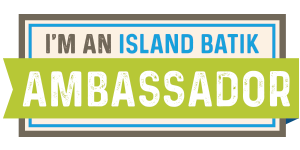 If you are interested in finding out more information on her work (rates, wait time, etc.) you can contact her here. I was also delighted to meet up with several members of the Thistle Quilt Guild, also based in Pictou County - a very friendly bunch! The show continues today at the deCoste Entertainment Centre, 99 Water St, Pictou, NS from 10 am– 5pm. A great show and well worth a visit.